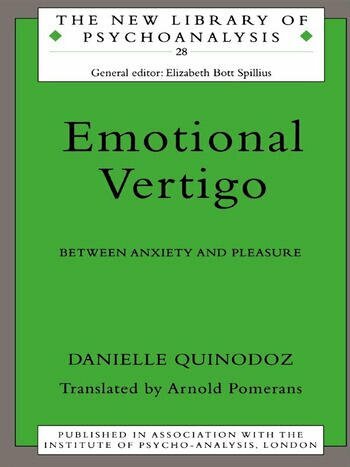 In this unique, prize-winning study Danielle Quinodoz unravels the unconscious significance of the feelings of vertigo which arise in situations where there is no immediate physical danger of falling and no organic cause. She traces the origins of such emotional vertigo to inner anxieties around separation which are expressed somatically at different levels according to the level of anxiety. Through a detailed case study of a patient who developed the symptoms of vertigo during analysis the author offers some thought-provoking insights into the vicissitudes of the object relationship and the importance of the role of the analyst in helping the patient translate sensation into representation. She also reflects on the links between anxiety and pleasure in the experience of vertigo, clearly exemplified in sports such as rock-climbing or skiing, and shows how vertigo is inexorably linked to questions of equilibrium at the psychic as well as the physical level. Emotional Vertigo is an excellent introduction to some of the central themes of current psychoanalytic thought. Gibeault, Foreword. What is Vertigo? Fusion-related Vertigo. Vertigo Related to Being Dropped. Suction-related Vertigo. Anxiety About being Sucked up by the Object. Imprisonment / Escape Related Vertigo. Vertigo Due to Attraction to the Void: The Emergence of Internal Space. Expansion-related Vertigo. Competition-related Vertigo. Vertigo, from Anxiety to Pleasure. What Makes a Candidate for Vertigo. Vertigo in the Work of Sigmund Freud and Melanie Klein. Dangerous Games with Vertigo. Equilibrium: A Continuous Construction.